The wife of the groundbreaking cryptanalyst William Friedman finally gets her due as equal partner in their pioneering codebreaking work over 30 years. While her husband was long treated by the National Security Agency as the “founder of the science of modern American cryptology,” it was the partnership with his wife, Elizebeth, that drove the two to brilliant heights in the field. Journalist Fagone (Ingenious: A True Story of Invention, Automotive Daring, and the Race to Revive America, 2013, etc.) 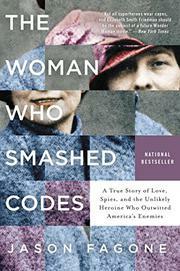 does a bang-up research effort in unearthing the true story of this humble Midwestern codebreaker, who often gave her husband the credit while her own work (and much of his) had to remain in secrecy because of concerns of national security. However, the sexism of the time would also play a role in how her work was undervalued and underreported; as the author notes, “when powerful men started to tell the story [e.g., FBI director J. Edgar Hoover], they left her out of it.” A remarkable meeting of the minds occurred when Elizebeth, a recent college graduate, was introduced to William, a mild-mannered geneticist, at the wealthy Chicago businessman George Fabyan’s fabulous Riverbank “laboratory” in Geneva, Illinois, in 1916. Elizebeth had been hired to figure out the cipher in Shakespeare’s First Folio that was supposed to reveal its author as Francis Bacon, and while she lost faith in the project, she found she had a knack for code-breaking. With the war escalating, she and William led the “Riverbank Department of Ciphers,” fed by a stream of encrypted messages from Washington, D.C. Over time, they developed into a fine-tuned team, and Fagone explains without arduous technicality how the process worked—then pen and paper, without machines. Between the wars, the two wrote books, and Elizebeth helped crack messages from rumrunners for the Coast Guard. World War II brought the challenges of breaking Magic and Enigma, among other astounding achievements across the globe. An engaging resurrection of a significant player in the world of cryptology.